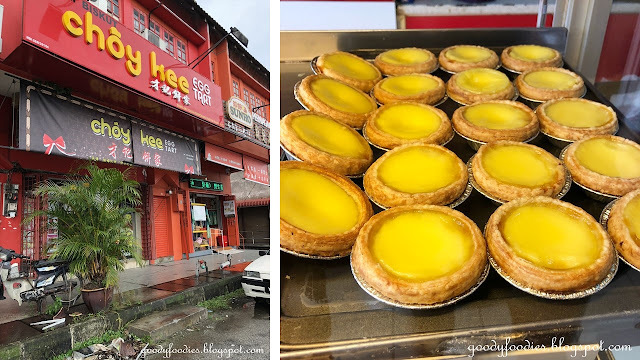 When in Ipoh, one of the snacks we love are the egg tarts. We have previously tried the egg tarts from Egg Tart King and Nam Heong which are equally delicious. This time, we tried the egg tarts from a renowned bakery in Bercham, called Kedai Biskut Choy Kee 才記餅家. Upon entering the shop, we were greeted by the delicious smell of pastry... one of the workers have just brought out a fresh tray of freshly baked tarts. Their pastries are displayed in a glass display cabinet at the front of the shop, and there are also breads, swiss roll and butter cakes available for purchase. We got 4 of the egg tarts (RM1.60), 6 mini blueberry cheese tarts (RM6 for 6 pieces or RM1.20 each) and the staff managed to convince us to try one of their cheese egg tarts (RM2.30). They also have kaya puffs, siew pau and wedding biscuit. Hubby also got two of the chocolate balls with chocolate sprinkles (RM0.60 each). We took this back, along with our tapau-ed soy bean and tau fu fah to our hotel to enjoy. The egg tarts were delicious, buttery and flaky with a silky egg custard. We also loved the cheese egg tart that the staff recommended (top layer cheese, bottom layer egg custard so it has a richer taste compared to the normal egg tart), and decided to go back to get more before heading back to KL. Even the chocolate balls were yummy - they're like chocolate fudge cake, I especially like them when they're still chilled. The cheese egg tart only got as far as the front door, and into our stomach it went! No better view to enjoy our egg tarts! They also have another outlet (Choy Kee Bakery) at 218 Lebuh 3 Simee, Ipoh. Opening times: 8am to 6pm. Closed on Mondays. Price: First visit RM15.70, Second visit RM25.30.